A huge hydrangea bush is any gardener's dream, as is mine. However, I've never managed to grow a hydrangea that big and bushy, moreover, I've always killed them, somehow. 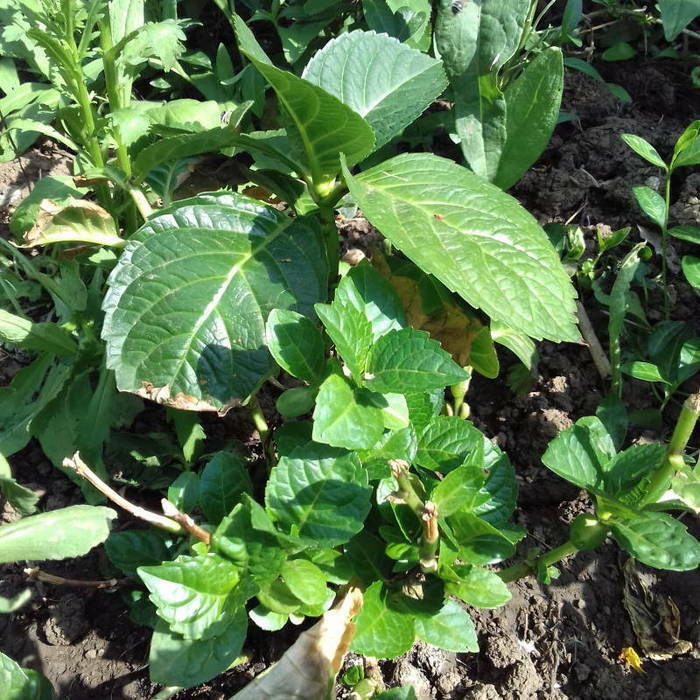 But that was up until last summer, when I discovered the perfect spot, where my hydrangea will grow as bushy as it can be. When I was a child, huge hydrangeas were growing in every block's garden from our old neighborhood. 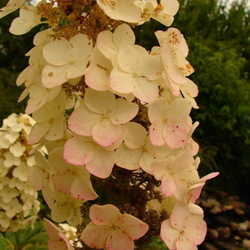 Back then, they were called hortensia, but in Romanian, the name still remained as a common name. I might have stolen a flower or two occasionally, which proves that I was very interested in those plants even then, even if I was only a child. I was also using their leaves for "cooking" for my dolls, but not very often because the block's garden was something forbidden and very well cared for by our parents and our neighbors. But what I remember very well is the beauty of those hydrangea bushes. Not all the hydrangea bushes survived during the years in our neighborhood, but only those planted in shaded spots. 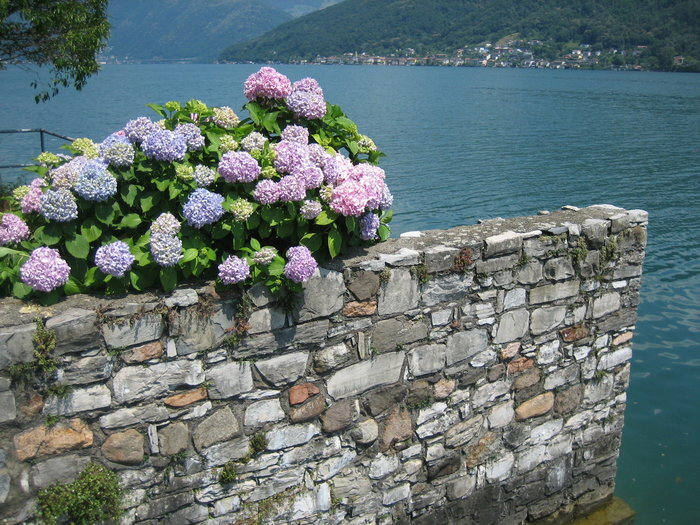 Hydrangea plants often pink or blue flowers, but they say that some blooms are white too. My mom told me that I have to pour ink at the plant's roots in order to change the blooms color to blue. However, it seems that part of this is true, or at least it was true years ago, when the ink's composition was different. I did some research and found out that the hydrangea's bloom color depends on the soil pH, unless they are white. White hydrangeas stay white, regardless of the soil's composition. If the soil is more acid, the flowers will be blue and if it's less acid, the flowers will be pink. An old plant can have green blooms which is a sign that the bush must be trimmed back. 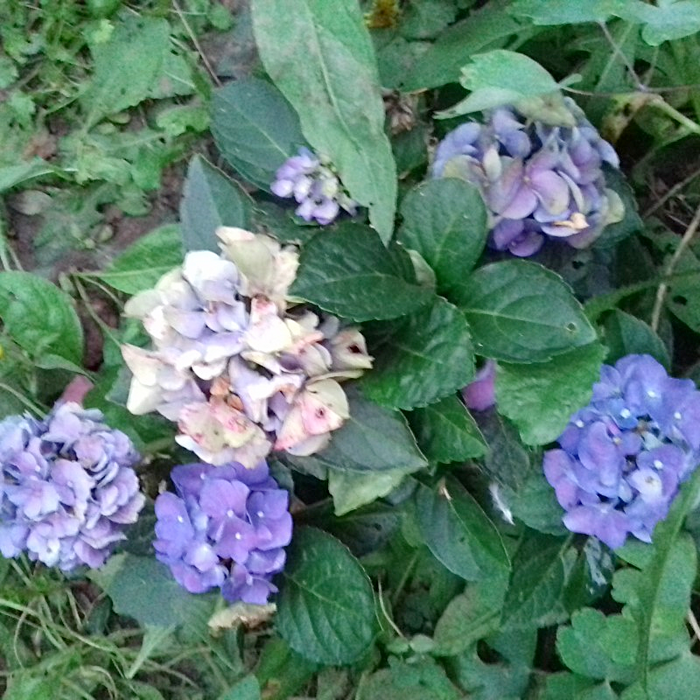 The thing about pouring ink on the hydrangea's soil surface in order to get a blue color of the blooms is still debatable, as is the ink's blue color. I've never had the chance to try it, but it must be true if mom said it. I decided to do a little research about the ink and I found out some very interesting things, which solved my dilemma. The old iron gall ink, which everyone in this world was using until the eighteenth century, was made with tannic acid and iron sulfate. Tannin is an astringent phenol, a dark substance contained in grapes, cocoa and tea, which gives them the specific bitter, astringent taste. Iron sulfate is a mix of salts which was used for coloring the ink, which had to be dark in color in order to contrast with the paper. It also had to flow easily but to stick to the paper, yet not to be easily erased. The color blue was chosen because of the necessity to distinguish any copy from the original and it was obtained by adding a blue dye - that simple! 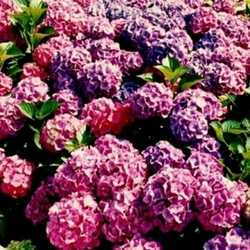 So, why does ink change the color of the hydrangea blooms? Does its blue color have anything to do with this old myth? It seems that the answer is simpler than that: it's only because of the ink gall's acidity and not because of its color! That's what this ink does, increases the acidity of the soil, which makes the blooms turn blue. My mom used to grow potted hydrangeas on her balcony. I remember how healthy her hydrangeas were and how beautiful their blooms looked because mom had more than one. She enjoyed making new plants very much. She used to trim them back and like all gardeners she just couldn't throw away the cuttings. She would cut them in smaller pieces, then keep them in a jar filled with water until they rooted. I remember how she used to trim the remaining leaves' tips, so they won't consume much of the cutting's food. Of course, some of those cuttings came to me because I also wanted to have some nice hydrangeas. I am a very good daughter and I've always listened to what mom says, including how to grow any plant she gave me, including the hydrangeas. I was following all the steps she said I should in order to grow a healthy hydrangea. The plant was growing very well in the first year in a pot and it was even blooming. But when I replanted it into the garden, it didn't last long and died. I even started my own cuttings, but I've never had any luck with them. Then I bought several potted hydrangeas, which I thought that would thrive better in my garden. I tried planting them in several different spots, but they all died after the summer. To be honest, my dog, Minnie gave a hand too, by digging some of them out repeatedly, until I understood what she wanted to teach me - as the garden helper that she is - that those spots weren't good for a hydrangea. 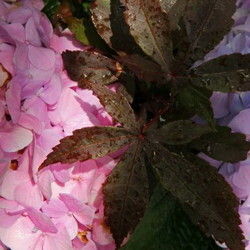 I started to search for more information about hydrangea, online or from other gardeners (especially mom.) I checked pictures of gardens full of hydrangeas, to see where the gardeners planted them. I even paid attention to the hydrangeas I saw in movies! All those led to only one conclusion, which was that I needed to find a shaded spot in my garden and that would be the perfect spot for my hydrangea. That was the question I had to resolve during that summer, while walking around the garden. 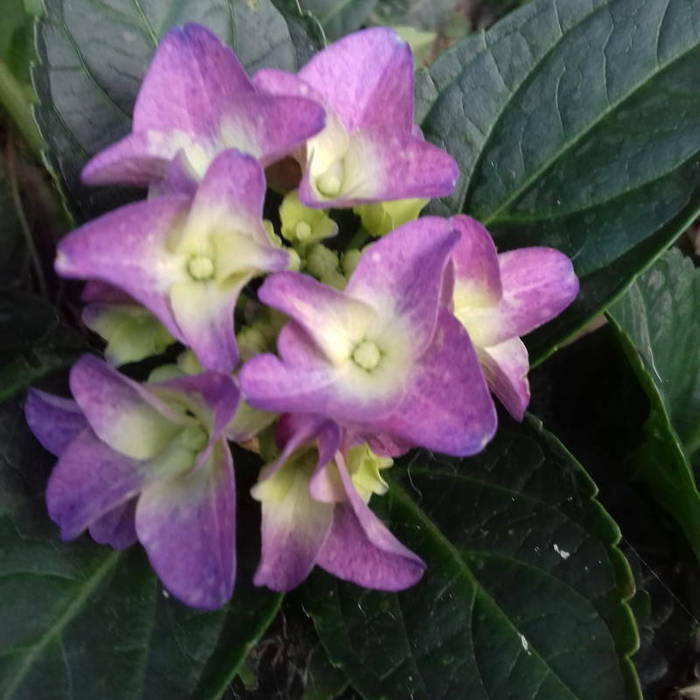 In the spring, when the first potted hydrangeas appeared at the superstore, I bought a pink one and I already knew where to plant it, behind a forsythia bush. Actually, the spot is surrounded by several rose bushes too, which was keeping it shaded during the hot summer afternoons. At first, all the blooms faded, but the leaves grew healthy, yet not so bushy. The first bloom was also pink and so beautiful! My new hydrangea lasted all summer and bloomed constantly because I watered it well every day and also, because the sun rays couldn't damage it - nor did Minnie, which made me more confident that the spot I chose was the correct one. Funny thing, although I haven't poured ink at its roots, the following blooms became blue - so my soil must be acidic. This spring, my hydrangea started to sprout, so it survived well through the winter and that made me hope for a future hydrangea bush. I'll be waiting anxiously for it to grow and bloom again. If the blooms stay blue, it would be great! After all, I have lots of pink flowers in my garden, for all seasons; roses, columbines, morning glories, petunias, even tulips. And to think that I didn't have to use any ink to make it blue. Now, that's a news which I'll have to tell mom about!